Vipurial is a mighty Archangel who wields the Nezzius, a long sword ablaze with green flames. This reply was modified 3 years, 2 months ago by Viper. Here is the Nezzius, the Archangel Vipurial’s mighty sword. Jin Ryu was a clan member of the IHU (Immoral Hive Unit) until he killed it’s leader and took up the throne. Now he wants nothing more than to lay waste to humanity and bring about the rise of the IIU (Immoral Insectiod Unit). These are the twin Sting Blades that Jin Ryu, or Bombius, wields in combat. 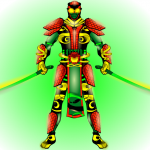 An energy blasting, martial arts master with an advanced combat suit. Colt was a bounty hunter who never failed a contract until he was sent to kill the Galactic Viper. A gun slinging assassin who is also trained in the art of Ninjutsu. Hey! As part of the art trade, here’s my take on Python. I’ve been away from this far too long so I’m trying to get back in the game. There’s been a lot of really great work in the art gallery so I’ll try to keep up LOL. The Angel of the northern winds. The Guardian of the Terra and the mother of nature. Ryael comes from the planet Talithiddon, a desert world with sandy mountains, golden clouds, and an orange atmosphere. It is located near the center of the Galyion Thetos galaxy. So, with the picture above, I wasn’t sure how it really turned out. I don’t know if the flames and the lights around them are a little too much or not so I’m posting a second picture, one without all of that “not needed” brightness. Anyways, if anyone can tell me which picture is better that’ll be great.